Can you name the film and say what was going on? Thanks Bryan for this 2019 Doris banner and fun quiz. Since the photo is black and white and is from Doris' early career; It can only be from The West Point Story or Starlift. Is this photo from the movie Starlift? I think Doris is offering a chip or sandwich to Gordon. Yes, Johnny, you are completely right, the film is Starlift, and actually, Gordon is holding a plate of sandwiches out of view and Doris has taken one, I'll post the full image a bit later. The heightened use of black and white gives this shot a lot of visual impact. The contouring of the skin is well done too. Has anyone seen Starlift? I think I have it somewhere but never got around to watching it. I saw it several years ago. Although I seldom agreed with critic Bosley Crowther, his review of this film was an exception. He had only one positive thing to say about it: "Among the acts, Doris Day's several warblings of old songs are the easiest to take." Starlift is not a great film but it is a historical flashpoint in how the movie industry was involved in entertaining the troops. It is fun to see Gary Cooper, Virginia Mayo, James Cagney, Randolph Scott, Jane Wyman and the rest of the Warner Bros. stars. From a fashion perspective Starlift is a rather amusing film. There is an element of charm and the music is pleasant. Of course the best part of Starlift is Doris Day. Johnny, "Ballad of Josie" and "Caprice" are both available on Amazon in DVD format. WWYWTLWO appears to be available from Amazon only in VHS format. I will check Amazon out. I saw Starlift once on TCM but have very little memory of it aside from Doris stealing the movie. Regarding Caprice on DVD: if you have a BLU RAY player, there is a German import three disc set of Caprice, Do Not Disturb and Move Over Darling. It is a region free release with an English language option. The films are presented in HD 1080 widescreen format and they look great. They also come with the same extras as the DVD versions and I've really enjoyed watching them at home. The title of the release is The Doris Day Premium Collection. I haven't been able to find a DVD or BR copy of Where Were You When The Lights Went Out anywhere. According to Amazon, the Premium Collection is "currently unavailable." My apologies. I should have checked Amazon before I mentioned that. I hope they get more in stock soon. I thought I'd make The Glass Bottom Boat (1966) our Film of the Month - a new concept, let's see how it works out. This is partly because I've just listened to a great podcast on it, which I recommend people listen to, by Kathleen Noll and Philip Estrada on Old Hollywood Realness: the podcast that celebrates the glitz and glamour of tinsel town's golden era. It's also on iTunes: https://tinyurl.com/y8vw6ngd (episode-32). Beyond that, it's a great celebration of Doris, the film, the cast, and the era. 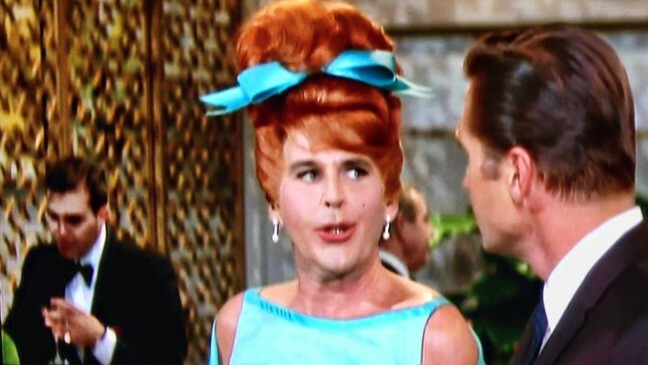 Philip does a great impression of Paul Lynde and I enjoyed the way they placed the film in the mid-sixties and compared it to everything else that was going on at the time. At just over an hour, it's a treat for fans of Doris and The Glass Bottom Boat. Fun idea to have a film of the month, Bryan, and to start it off with GBB. There's so much to like about this movie -- the satire, all the talent, the costumes, the chemistry between Doris and Rod Taylor, the quirky humor -- and the physical comedy is terrific. Great idea a "film of the month" tribute to Doris films. I like "The Glass Bottom Boat" It's a feeling good movie. There is fun, beautiful scenes and even some singing by Doris. Thanks for the new banner! Thanks Bryan for "the film of the month" idea. The Glass Bottom Boat is such a joy to watch. Doris' physical comedy and the supporting cast take the audience on a rollercoaster ride of laughs. GBB was a departure for Doris because it was a screwball comedy in the tradition of Bringing Up Baby or It Happened One Night. The emphasis was on farce, slapstick, absurd situations, and oddball characters. There were traditional romantic comedy elements but GBB relied on physical comedy and sight gags with Doris taking the Bugs Bunny role and a posse of Wiley Coyotes in hot pursuit. No surprise there because director Frank Tashlin had an extensive background in cartoon animation. Another key difference was the spy spoof theme which Doris had never done before. Most people didn't notice the differences but GBB was a subtle shift in direction from her traditional romantic comedies. Smart move, because it was a hit and Doris got the a chance to demonstrate her physical comedy prowess. Bryan, I did not like that podcast at all. It was profane, ageist and plain silly IMO. Some good points you make there, Michael. Many of them. I felt, were celebrated in the podcast. Sorry, you didn't like it. It was very juvenile and a bit crude in parts, I agree, but not too different from late-night TV over here these days! Personally, I was able to let the odd bit of 'profanity' fly past me as I felt they were being very genuine about Doris and the film. It also seemed very 'American' - so maybe it was a bit too close to home for you. If anyone is offended by bad language. I'd advise steering clear. Love the new banner, Bryan. That sultry look on DD's face really stands out thanks to that dark blue background. Love the film ... wild and wacky! Bryan, I love this Doris Day banner. It is a sultry and different Doris image than we are used to seeing. She has a strong I dare you attitude in this image. The simple and vivid blue background gives it a classic look. Blue is the universally most loved colour around the world. Thanks for your level headed response. I just call them as I see them and did not mean to stir up anything. So many alleged comics and wannabe media stars today resort to using the F word and lacing their language with profanity when they don't have anything original or clever to say. Maybe I am becoming prudish in my old age, but I'm weary of the rampant vulgarity in pop culture. That said, I think your idea of introducing a new topic about each of her films is a great one and I applaud your creativity and dedication to the forum. Bravo and by all means, please, carry on. Thanks, Howard and Johnny, Doris' look has passed the test of time, hasn't it? And thanks Micheal, you know I respect what you say and I'm sure there will be many who agree with you. I just ask if that if you haven't heard it, if possible, try and ignore the occasional bad language as I still believe they genuinely loved the film and Doris in particular. I've probably heard too much bad language in my lifetime to take much notice of it, I'm afraid, but I try to be very economical with it and it's usually reserved for politicians on TV! But can you name the familiar actor with Doris below without looking it up? We went to see Stan & Ollie tonight - such a beautiful film, it was very hard holding back the tears towards the end and the two friends I went with said they felt exactly the same. It's very understated and all the better for it - I'm sure our friends in the US will also love it. One criticism I'd make of some US films is you tend to turn on the sentiment a lot with lush music that almost instructs you to reach for a handkerchief. This is more the British approach! The actor with Doris in the photo is Edward Andrews. He co-starred in three Doris films.